2011 Costume Art Ball: Sideshow! Femme Vivre here to tell you, Step Right Up and Get Your Tickets!! Not to the fair, not to the gun show, but to this year’s Costume Art Ball! The theme? Sideshow!! Come see the freaks, geeks, and hoochy koochy dancers, live on the inside! Saturday, October 22 is the big day: from 8pm to Midnight there will be drinks, dancing, Midway games, caricature artists, cotton candy, a silent auction, a raffle, and a variety of sideshow performers for your viewing pleasure! As if that weren’t enough, there’s a costume contest! (In order to attend you must be in “obvious full costume,” no costumes over a PG-13 rating please, and you must be at least 21 years of age.) Furthermore, the Costume Art Ball is a yearly fundraiser benefiting the Creative Arts Center of Dallas. Where is that, you might ask? The answer is: 2360 Laughlin Dr., Dallas, TX. 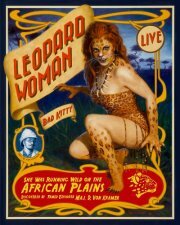 I hope to see you there; just look for the Leopard Lady! This entry was posted on Wednesday, October 12th, 2011 at 5:37 pm	and is filed under Art, Events, News, Performance Art, Vintage Lifestyle. You can follow any responses to this entry through the RSS 2.0 feed. You can skip to the end and leave a response. Pinging is currently not allowed. « COMIC BOOK RELEASES FOR THE 2ND WEEK OF OCTOBER!! !